Congrats on your purchase of a Doodle3D. Before you start using it, we have a few pointer to help you get started. Before you start a new batch of prints, it's a good idea to prime the nozzle manually. The reason for this is that the firmware of the Ultimaker2 performs a fairly large retract at the end of a normal SD Card print. Because of this there's a risk that there will be a lack of plastic at the very beginning of a Doodle3D print. Manually priming the nozzle makes sure this doesn't happen. You prime the nozzle by going into Maintenance -> Advanced -> Move material on the printer. Wait for the print head to get up to printing temperature and then turn the dial to advance the filament. Turn the dial until filament starts coming out of the nozzle and then exit out of the menu. A quirk about the startup of a print is that Doodle3D doesn't tell you the temperature of the bed, so it might look like the printer is just sitting there doing nothing when in fact it's waiting for the bed to reach printing temperature. It can take around 5 minutes for the bed to heat up. 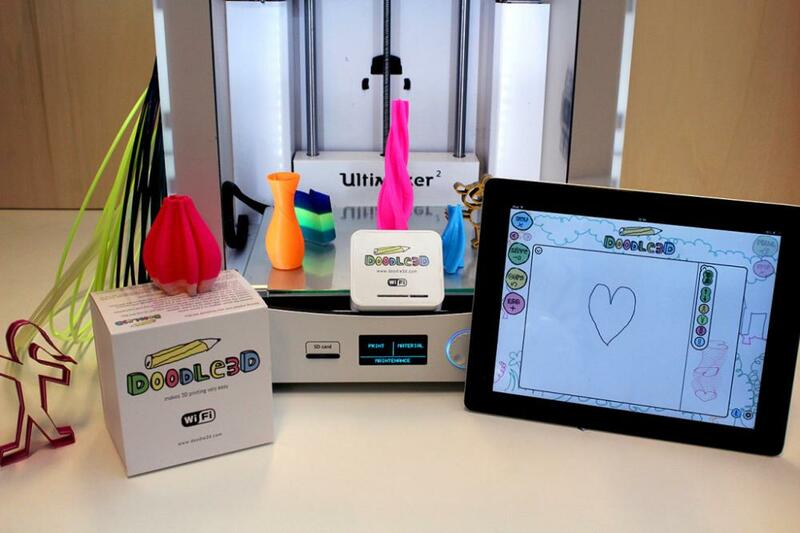 Start by connecting the Doodle3D box to power and to the Ultimaker via the included USB cable. Connect your tablet (iPad or Android) to the Doodle3D WiFi network. The network name is listed on a sticker on the Doodle3D device. Using a web browser, go to www.doodle3d.com to connect to the Doodle3D user interface. Press the settings button in the lower right. Select the Ultimaker2 as your 3D printer. Change Bed temperature to 55C (instead of 70C) and Preheat bed temperature to 55C (instead of 70C). The reason is that 70C is a temperature that is unnecessarily high for PLA and can cause the lower part of a print to "cave in" on itself leaving a thin band around the part. You can read more about that here. Also, using 55C will make for a faster start up time when starting a print. If you want to restrict printing to a smaller area to prevent print designs that are big and takes too long to print, you can change dimensions in x and y to smaller values, for example 100mm by 100mm.